3.2 Route 2: Laser Safety Class! 16 How do I send files to the Laser computer over the internet? 17 Ok, I created a folder for my laser cutter files, but can I access them over the internet? 18.1 Help! All the menu options turned to gibberish! Route 2: Laser Safety Class! Laser safety training classes are posted on our Meetup. Size is limited to 5 students, so that everyone can see how to operate the laser. The laser training class is pay-what-you-can, and the recommended minimum donation is $20. The laser cutter is generally a very safe machine to use. However, as with all industrial machines, you need to treat it with respect. The main safety concerns are creating fires, hurting your eyes or skin, getting crushed by the machine, and creating toxic fumes. ALWAYS MONITOR THE LASER BEAM CUTTING YOUR WORK! DO NOT STARE DIRECTLY BECAUSE BURN-GENERATED VISIBLE LIGHT IS VERY BRIGHT! The water squirt bottle is sitting on top of the laser, and the estop is the round red button. You can really hurt yourself or burn the building down with this machine. If you follow the safety rules, the chances of you causing this is close to zero. Some materials are very flammable on the laser cutter, and shouldn't be cut. Never cut an unapproved material, or a material you can't identify. A laser beam can also initiate a fire if the speed of the cut is too slow or the laser power is set too high. ALWAYS MONITOR THE LASER CUTTER WHENEVER IT IS CUTTING AS FIRES CAN HAPPEN. The laser affects your material by heating it. Your job can change in seconds with the accumulation of heat in your material. Never leave the room while the laser is in operation. If you leave the laser unattended, your access to the laser cutter will be permanently revoked. Use reasonable speed/power settings. Start with the recommended speed/power settings for your material. Be patient - resist the temptation to crank the power and speed to rush through your job. This can cause fires. There will be some light when material is cut. This light at the point of lasing may be ok as long as it stays with the motion of the laser. If a flame appears while the laser is in operation, stop your job and try again with lower heat settings. Know where the fire extinguisher is in case of a fire. The ONLY fire extinguisher that should be used on the laser cutter is the halotron extinguisher right next to the laser cutter. Other fire extinguishers are corrosive and will ruin the machine. Push the estop. (To turn the machine back on after the estop was hit, you need to switch the power switch on the right hand side of the machine off and on again). If it's small, try and blow it out. If it's smallish, try and squirt it out with the water squirt bottle sitting on the right hand side of the machine. If that doesn't work, use the halotron fire extinguisher to the right of the laser cutter. Aim it at the base of the flame. The laser beam can instantly and permanently blind you. It can also burn your skin. The lid's window will block the infrared laser beam, but it doesn't block the visible light produced by the burn. THE VISIBLE LIGHT CAN BE BRIGHT ENOUGH TO DAMAGE YOUR RETINA! DO NOT STARE DIRECTLY AT THE CUT! Use your peripheral vision. You don't ever want any part of your body in contact with the beam. As long as the door is closed, you're safe to look at the laser. There are interlocks on the door that help ensure the laser never operates with the doors open. Don't disable them. The laser cutter is a dumb machine. It doesn't care whether your hand is in the way when it's moving. The head can move when the door is open. Always make sure everyone's hands are out of the machine before moving the head. Also be very careful not to crash the head into other parts of the machine. Be very careful when moving the z-axis to not crash the head into the bed, and to not move the z-axis if the focus length acrylic circle is under the lens. If you need something to weigh down your material, use the magnetic balls or beanbags that are kept near the laser; nothing else. Do not let the laser head crash into these; if it does immediately stop the job. Be *very* careful to not put the beanbags (or any other material) in such a situation where they may be dragged by the head. The head should never bump into anything, and *especially* never drag anything. 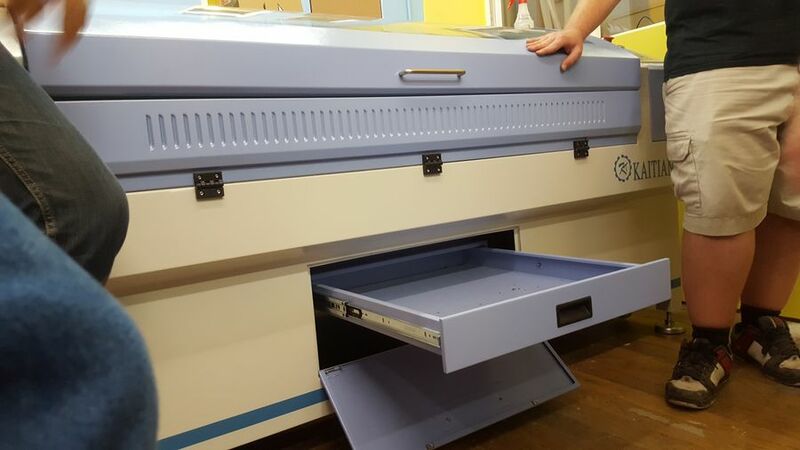 The laser cutter burns the things it's cutting, which can create toxic fumes. ONLY CUT APPROVED MATERIALS. Cutting nonapproved materials can release really toxic gases, including chlorine and cyanide. These are really bad for humans, as well as being very damaging to the laser cutter. The ventilation fan should always be running if the laser cutter is on, even if it's not cutting. It's currently wired such that you can't turn on the laser cutter without the fan turning on, but please make sure it's running. Please don't perform any maintenance on the machine (including cleaning lenses/mirrors or aligning mirrors) unless you've specifically trained on it. The laser cutter is finely calibrated piece of machinery. Please close the lid gently, and do not push or jar the machine at any time. Do not lean or press on the tray - it's fragile, and needs to be perfectly flat for the laser cutter to cut properly. If you take the honeycomb bed or slats out, please be ULTRA CAREFUL with them - put them somewhere where they won't get damaged or warped. The laser cutter has parts that wear out over time, which can be quite costly to replace, especially the laser tube. A new tube costs several thousand dollars. Thus, we require people to pay for the time on the laser they use, so we can pay for new parts. 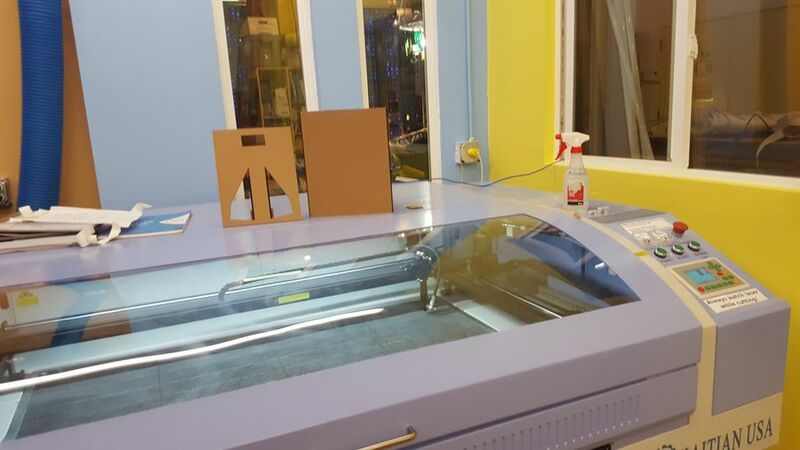 The cost for using the laser cutter is $5 per hour of cutting time. To figure out how much time your job takes, press the File button, select your file, and then select Work Time from the menu. It will tell you in hours:minutes.seconds. There is a laser cutter donation box on the wall of the Sparkle Forge room. Please pay for the cutting time you actually use, even if you end up running your job multiple times. This is the overall structure of the workflow. Each part is elaborated below. The laser chiller is the box on the bottom left of this photograph. If the laser doesn't beep when it turns on, you should turn on the chiller manually. Turn on power and ensure that the fan and chiller are running. If you do not hear beeps when the laser starts up, the chiller is not running and you must turn it on. 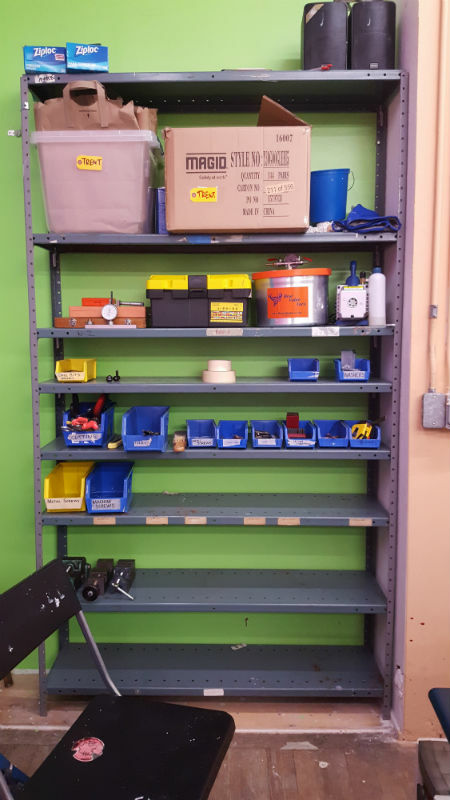 This is the shelf to the left of the laser cutter. The acrylic disks used for focusing the laser are in the toolbox with the yellow lid. Noisebridge has acryllic disks cut to various thicknesses that can be used to accurately focus the laser. Specifically the laser head needs to be locked to 8mm above the surface of the material you're cutting. Note that the honeycomb bed can move up and down (Z-axis) so if the material doesn't fit under, hit Z/U on the laser controls and navigate the menu until Z axis (or something similar) is selected. Then use the left and right arrows to move the bed up and down. Save as a DXF. Be sure to make the units be millimeters so that importing later will correctly scale the image. Convert bezier paths to lines (Extensions > Modify Path > Flatten Bezier). Flatness 0.5 is good to start with. Smaller = better approximation of the curves. A lower flatness number takes more time to compute, but also produces a better approximation to the curve. Be sure to ungroup (sometimes multiple times) before trying this, as grouped objects cannot be flattened as a group. This is especially important for text which is by default a group (each character being a separate object in Inkscape once you've turned it into a path). Sometimes need to select the path's directly with the path tool (but not the points!). Also see http://www.pstoedit.net/ for conversion from svg to dxf files. Resize as needed, tho if the file was exported w/ millimeter units, the software should also import the image with the correct size. OR Manually specify cut order with the Set cut property tool (Edit > Set cutting property). See below for more details. Optionally, simulate the cutting/engraving process. Download to the machine (Laser Work panel on the bottom right). In the Set cutting property window (Edit > Set cutting property), you can manually re-order the cut paths. In the window, you'll see an image of the workpiece, and to its right, two lists of paths. When you first open the window, all of the cut paths are in the left. If you select a path (either in the image or in the list) and click the button labeled ">>", this path will be transferred to the end of the right list of paths. If you click ">>>", all of the paths in the left list will be moved to the end of the right list (preserving order). Similarly, clicking "<<<" will move the right list to the end of the left list. If you select a cut path in the right list, the up and down arrow buttons will reorder that path in the chosen direction. Click "Load parameters from library"
Open the simulation window with either Edit > Preview or the toolbar button labelled with a monitor. It is generally a good idea to put the laser head into one of the top corners and resetting origin before opening the laser if you plan on adding new material to avoid collisions with a moving head. In the laser software, open the layers you wish to engrave in the layer parameters panel, and send the processing mode to "Scan". This will do a raster scan of the region bounded by the paths in that layer. An even-odd rule is used to assign regions to the "inside" vs "outside" of the engraving. This is the bottom tray of the laser, which should be cleaned out after use. Open the simulation window (see above). Total work time and time of laser use are displayed in the top right. Donations should be calculated by laser use, not total work time. Fusion 360 is a free CAD (Computer Aided Design) program from Autodesk for designing 3D parts, and arguably the best one currently available. If you're designing something complex on the laser cutter, particularly with multiple parts that need to fit together, I highly recommend it over drawing programs like Inkscape. It also has CAM (Computer Aided Manufacturing) capabilities, which makes it very useful for CNC machining and laser cutting. There's a copy of the software on the laser cutter computer, and you can download it here. It's free as long as you make less than $100k per year using it. If you're not sure, this is probably where you should start. This allows more complicated things like exporting splines, which doesn't work with the above methods, kerf compensation, which makes your parts fit together snugly, but you can also use the above methods and then do it in RDWorks, or lead-ins and lead-outs, which can make for a cleaner cut, but I can't figure out how to get RDWorks to import correctly. Look up the kerf of the material you're cutting in the #Known good materials section, and enter that in Kerf Width, or if your material's not listed, cut one a kerf gauge and put the result in the wiki. The kerf changes depending on the thickness, speed and power. Setting a larger kerf width will make your parts fit tighter, and setting a smaller kerf will make them looser. To export to DXF, click the Post Process button, which says G1 G2. Make sure rdworkslaser is selected as your post processor, type a name for the export and hit Post. Then select the folder to put it in. If you're using your own computer for the first time and not the laser cutter desktop, you have to enable the laser cutter support which is still in beta, by clicking on your name in the top right, then Preferences, Preview, and checking "CAM - Waterjet/Laser/Plasma cutter support". You will also need to download the custom post processor that we use for this laser. If you want to disable or tweak the lead ins and lead outs, you can go to the Linking tab. Lead ins and lead outs can fix the bump you get on the side of your part where the laser started and stopped, but they also make extra cuts in your scrap material, which you may want to keep. In this tab you can also specify the Entry Position for each cut path. For any given layer, you can compensate for the kerf (width of the cut) by opening it's settings and clicking the "Advance" button next to the "Seal" input box towards the middle-bottom. 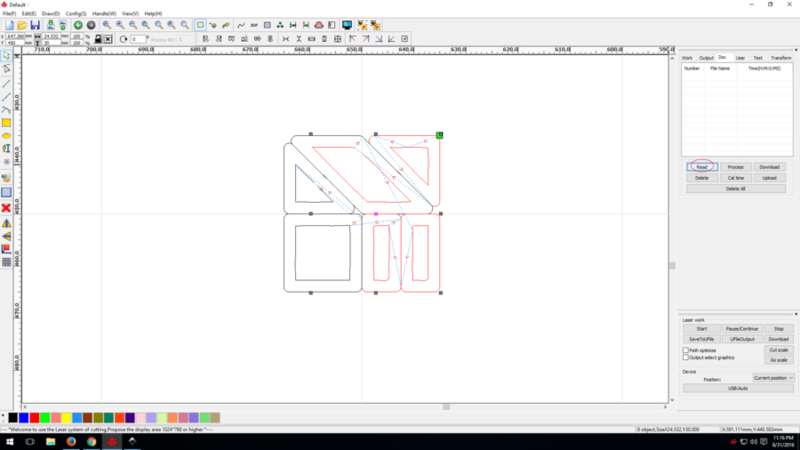 Enable sew compensation, and pick the direction and sew width (kerf size). The inward direction will make the actual cut move toward the inside of a closed cut path, outward will move it towards the outside. In general, for cuts on the outside, you want to move outward, to move the actual cut edge be exactly where the path is in your design. For cuts on the inside, you want to use the inward direction. You can engrave a vector shape with a hole in the middle of it, so that you get enclosed portions that are not engraved in the middle of fully engraved portions. To do this, when you construct the image in your editor of choice, simply perform subtraction between the relevant paths, to remove the inner part. In the RDWorks laser software, the two paths will show up, and be independently editable (making them look like just two distinct paths to engrave), but they will engrave correctly as a negative space. Obviously test this w/ your software; this technique is known to work using Inkscape. As of 01/2018 you can use the industrial strength Deepnest installed on the Laser Cutter computer + Collaboration Station in Hackitorium. We have an unlimited subscription available to laser users, which is compatible with both DXF, Corel CDR and SVG formats. Please ask if you need login credentials. Also available from the same author for free is SVGNest, which can be used by clicking here. In Inkscape, after converting the text object to a path, it's necessary to ungroup the text as well, to create separate paths, prior to flattening the bezier curves. If you're using a cursive font and want everything to be one piece, convert the text object to a path, and use Path > Union. This tool in general is quite useful for merging paths that have been independently drawn but need to be merged into a single path. For example, if you made two overlapping circles, without this the cutter would just cut the two circles, which leads to a lemon-shaped piece in the center. If you union the paths, it will cut an outline as well. Path > Union will not make any holes in the figure go away, it only gets rid of cuts passing through area covered by another shape. Engraved text requires no other special technique because no cuts are made, but text cutting is non-trivial. Because of loops, it's sometimes desirable to use a stencil font, especially at smaller scales where legibility is important. 1001 Fonts has a number of stencil fonts for free. At 10pt, some good fonts are Marsh, Spacedock, and Allerta. If the laser cutter has 99 files loaded into it, new files will not show up. To fix this, open up RDWorks8, and on the right side, select the Doc tab. Inside that tab, click Read to read all the files in the laser cutter, and then click Delete all. This is the button used to read stored files from the laser cutter. This is the button used to delete all stored files from the laser cutter to make room for new ones. ethanol solution? isopropanol? - see manual. fabric must be non scratch - see manual. Safety - remove gratings and any other reflective surfaces before any maintenance that requires disabling the door sensors. Tape test - mirrors 1,2,3 and their corresponding exits. Slightly propped laser tube. vertical/horizontal alignment by brass dial. power off the laser before opening the lid ??? Move the machine further away from the right wall so we can get to the power switch. Before you cut any new material you *must* check that it is safe to cut; specifically that it will not produce chlorine gas when it is burned by the cutting laser. Chlorine is extremely dangerous in its gaseous form and so must be avoided at all costs. To test a new material, you'll need a sample of the material, a small copper rod (about the thickness of a coat hanger), a pliars, and a handheld propane torch. We'll test for the presence of chlorine by burning a sample of the material in a high temperature propane flame and observe the visible emission spectra. Chrlorine produces a bright green light when burned, and so will be very obvious when you're testing your material. First, turn on the ventilation on the Sparkle Forge. The switch for this is under the sign that says "For Non-Laser Fires Only", and above the non-laser fire extinguisher. Then, light the propane torch and set it to rest upright on a stable surface. Taking the pliar, hold the piece of copper in the blue part of the flame to heat it. As the copper begins to heat sufficiently it'll cause the flame to turn an orange color. A consistent orange color means that the copper has no residue material on its surface and so is clean enough to use as a test. If you observe non-orange flames when you burn the copper you may need to clean in further, either by waiting for the excess material to burn off, or by scrubbing the surface of the copper when it has cooled. Once the copper is burning, take the hot copper and melt a sample of the new material onto it. For example if you were testing a new form of plastic you can roll the hot copper rod on the material, melting some of it onto the copper rod's surface. With this done, place the copper rod back into the blue part of the flame. Observe the colors of the emission spectra from the new material burning. If you observe a bright green color, then the material contains chlorine and thus *must not* be burned further. Ventilate your surrounding area to avoid breathing it in. 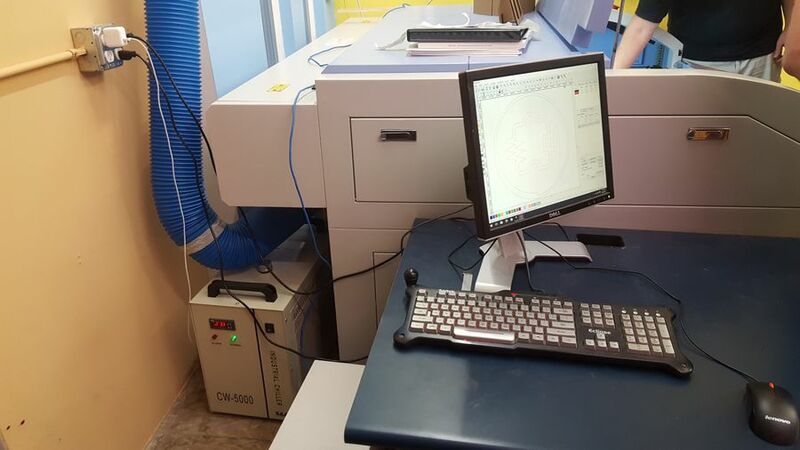 If you observe no green color as you burn your material sample, then the material is likely safe to use with the laser cutter. These materials must not be used in the laser cutter. PVC Contains chlorine. Will produce hydrogen chloride gas when used which is extremely toxic and also damages the laser optics. Vinyl Most contains chlorine. Will produce hydrogen chloride gas when used which is extremely toxic and also damages the laser optics. PVC Foams Most contains chlorine. Will produce hydrogen chloride gas when used which is extremely toxic and also damages the laser optics. Foam Core Usually made with PVC which is harmful as listed above. Polycarbonate or PETG Does not cut. TAP plastics sells both this and acrylic. Be sure to read your labels when purchasing material. Lexan is the trade name for Polycarbonate, while Plexiglass is the trade name for acrylic. ABS Gives off hydrogen cyanide which can kill you and also may damage the laser optics. Fiberglass Contains complex epoxies which will cause fires, chlorine, and cyanide. Also contains glass which will not cut. Metals Cannot be etched by this type of laser. Also is harmful as the reflective surface may cause the laser to be reflected back up to the head, damaging it. If someone claims to be etching metal using this type of laser then they are etching a metal with a plastic coating, anodized surface, or some other etchable surface on top. These materials are known to be ok for use with the laser cutter. The speed and power of the laser cutter will need to be set appropriately for the material and thickness in use. Below is a table showing the suggested settings when cutting or etching them. Balsawood (3.2mm) 400 5 50 10 Engraving balsa produces little differences in power above 5, and below 3.5 or so, there's no engraving at all. Balsawood (1.6mm) 400 5 50 7 Engraving balsa produces little differences in power above 5, and below 3.5 or so, there's no engraving at all. Basswood (1.5mm) 400 5-20 50 15 Engraving above power 20 seems to produce no difference in color, only depth, see reference piece in toolbox. Basswood (6.5mm) 400 5-20 20 55 Engraving above power 20 seems to produce no difference in color, only depth, see reference piece in toolbox. Birch (0.9mm) 400 5-15 40 20 Engraving is very finicky; 4 is the absolute lowest the machine will engrave at, 15 is high enough to cause serious charring on birch. The 5-15 range is best. See the test engraving for what the 5, 10, and 15 settings produce. Birch (4.8mm) 400 5-15 35 55 Engraving is very finicky; 4 is the absolute lowest the machine will engrave at, 15 is high enough to cause serious charring on birch. The 5-15 range is best. See the test engraving for what the 5, 10, and 15 settings produce. Birch (1/4 inch plywood from Discount Builders Supply) 15 55 The actual thickness of this stuff varies a lot throughout the sheet, plus there are knots in the wood that are harder to cut through. These settings should work though. Cardstock (white, 80lb) 140 6 140 4 The higher speed reduces the amount of browning on the edges. Cardstock (white, 138lb / 224GSM, Canson brand drawing paper) 55 5 140 3 speed 140 power 3 for a lighter score, speed 200 power 4 for a heavier score. Fabric - 100% poly gabardine from Fabric Outlet 100 7 You do have to pull the cut fabric apart (it's not a clean cut), but it rips at the cut cleanly. Fabric - 100% rayon crepe from Fabric Outlet 100 7 You do have to pull the cut fabric apart (it's not a clean cut), but it rips at the cut cleanly. I think this is just a property of the fabric melting back together after being cut. I tried increasing the power and it didn't result in a cleaner cut. MDF (5/8") 100 4-7 5 55-75 400 5-15 Cutting doesn't go all the way through necessarily, it gets spotty at this thickness. The power range was tested and produced similar results throughout, but YMMV. Etch speeds given for *scan* etching (i.e. when you do a filled area). You can tweak the speed and power to get different effects. Simple line engraving may have different settings. Notebook from Muji: Recycled paper notebook beige A5 plain, orange spine 50 5-35 5 will just score through the cover 10-15 will cut through, and 35 will cut through a few pages. Any higher and there's a fire hazard. Be sure to tape or weigh the book down flat or else it's more flamey. Polypropylene (0.5mm) 50 10 Ruth has found that 50 speed 20 power gives a cleaner cut for the 24x45 inch sheets from TAP plastics. Redwood (20mm) 100-400 55 3 55 5mm/s gets you almost there, so you could probably go over it a second time and it would work instead. Or if you sand it down a bit, that would probably work. I've only tried engraving on max power. You won't get a consistent depth, and it will vary depending on the grain of the wood. Looks col, but just be aware. Red Oak (0.25 inch) 400 23 12 55 Engraving power 23 gives a dark engrave on a .5-1 mm line thickness. 12-18 gave a lighter engrave. When cutting a knot in the wood, you'll have to use a lower speed, 9-10 will probably work. This wood was high quality scroll wood with almost no knots. The Laser Gallery contains some past projects and cutting tests. In general, you can get stuff from Amazon, but you have to wait for shipping. For plastics: Tap Plastics is nearby Noisebridge, but is expensive, eplastics is cheaper but you need to wait for shipping, and Mr. Plastics is cheapest but is in San Leandro. For woods: Discount Builder Supply is nearby. How do I send files to the Laser computer over the internet? Send your files directly to the laser cutter through this URL , which is kindly hosted for us by Disroot.org via Nextcloud. Please move any files you upload to your own folder asap. Ok, I created a folder for my laser cutter files, but can I access them over the internet? Yes, this is now possible as of 01/2018. Ping @James on Slack with the name of your folder. Be sure to mention if you need a password added to your folder. Wait a day for the share link to be activated and sent to you. Help! All the menu options turned to gibberish! Apparently DXFs exported from Solidworks (at least v 2017) break when directly imported into RDWorks. The workaround is to import the DXF into Inkscape and re-export it from there. This page was last modified on 13 April 2019, at 04:58.